Many large manufacturing plants are going fork truck free in 2016. This FTF (fork truck free) initiative reduces operational costs of running fork trucks as well as reducing injuries that occur from forklift accidents. Safety has been a growing concern in the workplace for decades, with OSHA statistics reporting that more than 100 workers are killed from forklift accidents and 20,000 are injured annually in the U.S. In cases of injury or death, a company is liable to pay considerable costs for damages and injured workers can miss on average 61 days of work due to the injury. The real push for FTF environments is improved throughput and productivity with reduced labor costs. The switch to forklift free environments means that workers are required to move heavy loads manually or with the use of AGV’s (Automated Guided Vehicles). 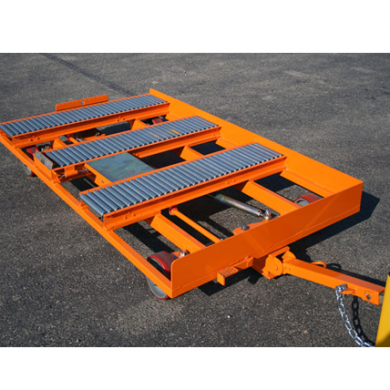 Transfer conveyor carts were designed to eliminate the use of the fork trucks. In FTF environments the Transfer Conveyor Cart with a container is tugged to line-side. There the container is usually manually pushed onto a roller container; then by power or gravity the container is moved into position. The transfer conveyor cart typically holds one to two containers that most have a smooth bottom for easy rolling. 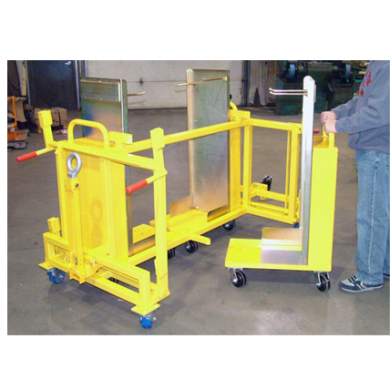 The space between the cart and the conveyor will determine the ease of the transfer. When positioning the cart by hand a caster system with low push/pull forces is highly recommended and is often necessary to stay with ergonomic limits. When the cart is tugged to the unload position and space is determined by a straight entry to the area and the accuracy of the driver. A side shift is designed on its Transfer Conveyor Cart which allows a 6-inch movement in either direction to reduce the space between the cart and conveyor. For FTF manufacturing plants where the container weight is over one ton, this is one of the best options available. Cradle carts eliminate the need for fork trucks in the assembly area; they present the material in an ergonomically correct position. There are major space savings at the assembly line which is one of the most valuable pieces of real estate in the factory. By inverting the material vertically and nesting the carts inside one another, the space requirement is much less than the material lying on a pallet or in a container. Topper Industrial brings companies considering a Fork Truck Free operation to various customer sites for benchmarking; to arrange an on-site benchmarking session call 800-529-0909.